MY WEDDING DAY IS IN NOWHERELAND, COULD YOU COME? I offer a destination wedding service across Europe, with a group of professional colleagues in UK, Portugal and other countries. My contacts on Lombardy lakes including a professional wedding planner and astonishing location near Como Lake, with exclusive services. If you dream a wedding upon Tuscany hills or sunny Sicily, don't worry, we've the solution for you. Yes! We offer a lot of accessories, such as polaroid prints, photoboot, analog services, photoalbums, digital boxes. No limits to fantasy on requests, just ask. DO YOU HAVE TIME LIMITS, OR PHOTO NUMBER LIMIT, FOR WEDDING DAY? The great day, if you want, i will be with you from the getting ready to the husband gone fishin' in the pool... Normally, my complete service ends at 20 pm for a morning wedding, or 00 am for an afternoon wedding. But we surely agree for extensions, if you need more time. Actually, i've a flexible team, that works with me when necessary. Two photographers are with me, alternatively, depending on service tipology, or requests. I'm the first photographer, and don't worry about my presence in your wedding, i'm the only first photographer in my team and i'm in, on every wedding day. I'M INTERESTED: HOW CAN WE TALK? Write or call me! A voyager pigeon, a whatsapp or Telegram message, snapchat, facebook, messenger, instagram, skype, smoke signals, an email, a wax tablet... Every method is good for me! We easily organize a first appointment by person or via Skype-Messenger call. HOW MANY PHOTOS YOU DELIVER? Actually, my final delivery is about 300 photos, and a draft pdf album, if you' have planned to buy a printed product. from my studio. Doing storytelling photography, i shoot a lot of images, and a stern selection is necessary, before delivering. DO YOU APPLY A POSTPRODUCTION UPON IMAGES? Obviously yes. The developing of raw files (and negatives, when i shoot analog), is an essential part of creative process; in my opinion, is the most important moment of my work. For other requests (cloning, cuts, re-editing, erasing some ex-girlfriends or mothers-in-law), we should easily talk after the first deliver. The delivered photos are your full property. You can easy print all the images you want, i deliver the photos at the maximum resolution and quality available. The raw files will remain in my archive for 5 years, starting from wedding day. DO YOU MAKE ALBUMS, PRINTS OR OTHER SIMILAR PRODUCTS? For photoalbums, since 2016 i'm Celebra partner. I have other album and print providers, for a wide choice. 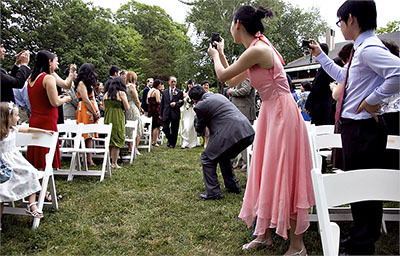 DO YOU MAKE STAGED PHOTOS, GROUP PHOTOS, RELATIVES TABLES PHOTOS, "CLASSIC" WEDDING PHOTOS? My photos are based on the sensations I collect during the day. I do essentially storytelling. Most classic portraits or photo memories must be expressly requested, and of course I can shoot any type of image. Photos to loved ones, or special people, should be explicitly asked, not knowing your family relationships. COULD "UNCLE BOB" TAKE SOME PHOTOS? Your marriage is a unique moment, and it must be enjoyed by the dear ones. I'm here to make pictures for you, it's not necessary for your relatives to carry cameras and stuff, and lose time and emotions for a thing that i already do for you. The realistic risk is that one of your relatives and friends will get in the middle, maybe with a huge Ipad, ruining an otherwise perfect picture ... I'll just ask you to tell to your relatives and friends (maybe with just a note inside announcement card), which is not the case to block my movements, as, without posing, I must be able to follow all the marriage without obstacles, or the job will not be qualitatively awesome. Of course, during the ceremony and any moments dedicated to your portraits, photographs made by relatives are not allowed. HOW ABOUT VIDEO SERVICES? AND DRONES FOOTAGE? Starting from this year, i will provide again a wedding video service. .No drone service is present in my offer, and i discourage that services, due to high related risks. f you engage a videomaker or an enabled drone operator, I will ask you to contact them to establish the working method before the ceremony so that you do not interfere with each other. AND ABOUT YOUR GEAR? ARE YOU A CANON-NIKON USER? Would you ever ask Gordon Ramsey what brand of pots prefer? Simply, the equipment doesn't count. The best photographers take the best from any camera. Henri Cartier Bresson, one of the best photographers of all time, snaps with a ridicolously cheap brass camera, compared to today's super cameras. Anyway (as Nikon and Canon simply do not produce this type of camera), i use a 645z digital medium format Pentax camera, sand Sony Alpha cameras. ARE YOU MEMBER OF ANY PHOTO WEDDING ASSOCIATION? Yes. These are some of my qualified 2019 submissions: other big news are coming!